Home / ABS-CBN / Chris Evans / Chris Hemsworth / Columbia Pictures / Jeremy Renner / Joss Whedon / Mark Ruffalo / Marvel Studios / movie / Robert Downey Jr / Samuel Jackson / Scarlett Johansson / Walt Disney Studios / Director Joss Whedon Brings Unique Style to "Marvel's The Avengers"
Director Joss Whedon Brings Unique Style to "Marvel's The Avengers"
There are few writer/directors in the world who have inspired the kind of fan devotion that Joss Whedon has. Beginning with the cult hit “Buffy the Vampire Slayer” and moving on to “Angel,” “Firefly” and “Serenity,” Whedon has imprinted himself on an entire generation of audiences. There are Joss Whedon fan sites, and his life and career take up a very long and informative Wikipedia page. English professors even use episodes of his TV shows to teach their students writing and storytelling. All of this, plus his love of Marvel comic books, is what made Whedon the perfect person to direct the epic, big-screen adventure “Marvel’s The Avengers.” The movie promises to be the Super Hero team up of a lifetime when an unexpected enemy threatens global safety and security and Nick Fury (Samuel L. Jackson), Director of the international peacekeeping agency known as S.H.I.E.L.D., finds himself in need of a team to pull the world back from the brink of disaster. He initiates a daring recruitment effort and gathers Iron Man (Robert Downey Jr.), Captain America (Chris Evans), Thor (Chris Hemsworth), The Hulk (Mark Ruffalo), Hawkeye (Jeremy Renner) and Black Widow (Scarlett Johansson) to fight together. 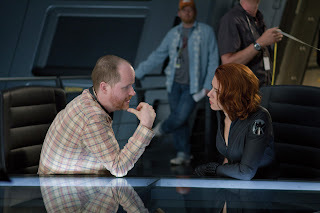 Whedon was also very excited about whom he got to work with on the film. “One of the big things that made me jump on board was the casting. Robert Downey Jr., Chris Hemsworth, Scarlett Johansson, Chris Evans and Samuel L. Jackson were already on board,” he says. “These are all actors who audiences got to see in movies of their own. 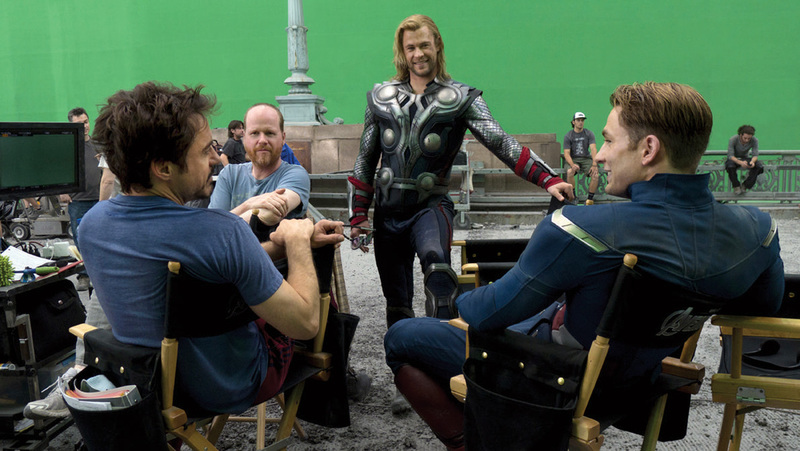 In ‘Marvel’s The Avengers,’ they get to see them interact with each other. Everyone is so good that this film is going to be unbearable to edit. “All of the actors came to me with an extraordinarily positive attitude,” he continues. “Not just about the project, but about each other. All of the conflict that we create amongst The Avengers is acting, because these guys are really rooting for each other and helping each other. “It’s been interesting. Everybody’s very different. Robert has that anarchic, uncontrollable energy that is very magnetic and very Tony Stark. I wanted Mark Ruffalo to play Bruce Banner because he’s just an open book. He lets you into his heart and you understand everything he’s feeling. That’s who he is as a guy and how he performs. Chris Evans really locked in to the old-fashioned sort of aesthetic of a guy who’s from the ’40s. He has rectitude without being stiff. “Sam Jackson is Sam Jackson. He does that look and he only needs one eye to pin you to the wall. At the same time, he’s extremely sensitive and textured and that’s what I wanted to get from Nick Fury. I didn’t want him to be all bluster. We’ve seen that and I think there’s more there. “Chris Hemsworth is a god. This is a man who just makes other men stop going to the gym. It’s not fair. He’s very centered in the way he approaches a scene and the way he is in life. Jeremy Renner has been a wildcard and keeps to himself, but that makes sense because he’s playing a sniper. He shoots a bow and arrow and keeps his distance. He’s fully engaged, but he’s in his own place. “Scarlett isn’t like her character at all, because she’s so funny and delightful. She’s always in a good mood and is just a riot. Black Widow has a darker incarnation in this film than she did in ‘Iron Man 2’ and Scarlett is very precise when she acts. We hint a little bit at her back-story and it isn’t pretty. 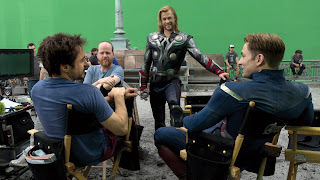 Whedon’s visual style for “Marvel’s The Avengers” is perfectly tailored for the project too. “As much as anything, my visual style as a director comes from comic books,” he says. “My understanding of visual storytelling comes from panel art, which I was reading more voraciously than I was watching movies for most of my childhood. In that sense, I had sort of a head start when I started visualizing this film. I hired Seamus McGarvey to be my Director of Photography because of ‘Atonement.’ It’s a gorgeous film. Seamus’ understanding of light as romantic and naturalistic is dazzling.